The Zaius Responsys integration automates the import of sends, opens, and clicks from Responsys into Zaius. Responsys only allows one export job per event type to be active at a time. For this reason, Zaius monitors the Responsys SFTP server for the presence of any event feeds and imports them as they become available. If your account does not have any active export jobs for sends, clicks, and opens, you will need to schedule the jobs via Interact Connect. Please consult the Responsys documentation for instructions on setting this up. 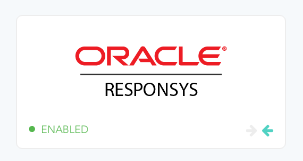 Please note that this may be different (but not necessarily) from the credentials that are used to login to the Responsys web application. You may need to contact the AppCloud Technical Enablement group to obtain some of the following information. If you go to the Interact Connect section of the Responsys web application and start to create an export job, in the second step of specifying the Target File you should be able to find the SFTP Hostname, Username, and Directory values. To find your Responsys Account ID, you can View Log in the Completed Jobs tab of Interact Connect. 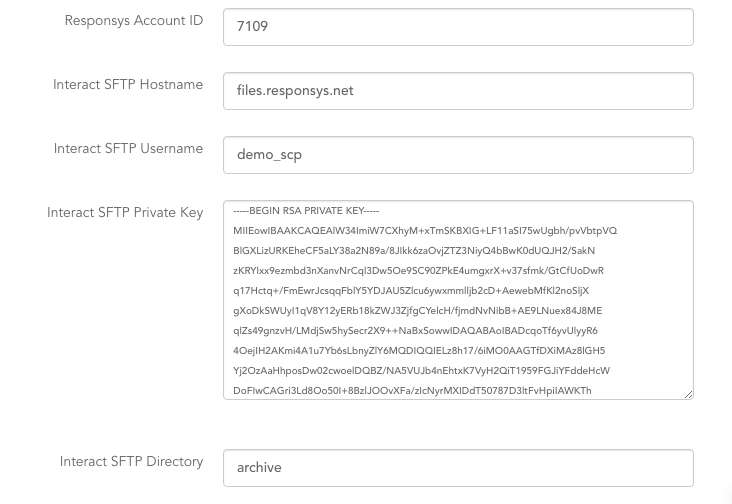 As far as the SFTP Private Key, if you do not already have that, you will need to work with the AppCloud Technical Enablement group to set that up. Once you have successfully saved your Responsys configuration, Zaius will begin the import of any existing feeds found on the SFTP server. Zaius will also monitor the SFTP server on an on-going basis for any new event feeds and will import them automatically.